Mohun Baga U19 sailed to a third consecutive victory with a 2-0 in the ongoing 122nd IFA Sheild having the better of Tata Football Academy U19 at the Howrah Stadium on Thursday evening finishing at the top of Group ‘B’. Meanwhile, Bengal Football Academy U19 edged past Churchill Brothers U19 in the other fixture of the group. 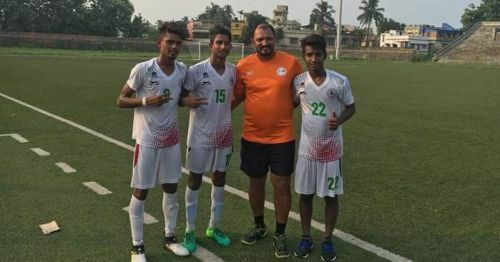 With both teams already having qualified for the semi-finals, the match between Mohun Bagan and Tata Football Academy decided the group leader. The Green and Maroon brigade started from the word go and created their first real chance in the sixth minute which was converted to a goal by striker Deep Saha after receiving a through ball from his teammate. Although TFA got a chance to equalise, the shot from Gaurab’s free-kick went off target. TFA played better football in the second half and even improved their defence strategies. But that did not stop the ‘Mariners’ as their chances came thick and fast but they have not been rewarded the second goal until the 89th minute. The breakthrough came via a counter-attack which involved two substitutes Pulak Barauti and Akshunna Tyagi at the epicentre. The former assisted while Tyagi found the back of the net to secure the win. More importantly, Mohun Bagan just conceded a single goal so far in the tournament which speaks a lot about their defence. Churchill Brothers, the only team from Goa went home without a single point in their bag losing each of the three matches they played in. Bengal Football Academy, on the other hand, will be pleased to grab three points in their win against Churchill Brothers in an otherwise disappointing IFA Shield campaign for them. Mohun Bagan will face off against SAIL Football Academy in the last four while Tata Football Academy will be up against Kolkata giants East Bengal. The semi-finals will be played on Saturday and Sunday respectively while the final is scheduled to take place next Thursday, July 19th.